Aage Niels Bohr (1922-2009) was a Danish nuclear physicist and winner of the 1975 Nobel Prize in Physics. In 1940, Bohr began studying physics at the University of Copenhagen and working as a secretary and assistant to his father, Niels Bohr. In 1943, the Bohr family managed to escape German-occupied Denmark for neutral Sweden. Bohr accompanied his father in his work as a Manhattan Project consultant (the elder Bohr was codenamed "Nicholas Baker"; Aage, "James Baker") in Los Alamos, Washington, and London. He served as his father's secretary and assistant, with occasional collaboration on physics work. His official title was Junior Scientific Officer at the Department of Scientific and Industrial Research in London. American security agents reported that ensuring the safety of the "extremely absent-minded" Bohrs could be challenging. After the war, Bohr returned to Denmark to continue his university studies. 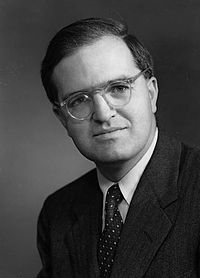 He was also a fellow at the Institute for Advanced Study at Princeton and worked with Isidor Rabi at Columbia University. After returning home once more, Bohr and his longtime collaborator Ben Mottelson began years of important research on nuclear structure. In 1956, Bohr became a professor of physics at the University of Copenhagen. After his father's death in 1962, he succeeded him as director of the Niels Bohr Institute. He later became director of the Nordic Institute of Theoretical Physics (NORDITA) in Copenhagen, and received numerous awards and honors, including the 1969 Atoms for Peace Award. Bohr shared the 1975 Nobel Prize in Physics with Mottelson and fellow Manhattan Project veteran Leo James Rainwater “for the discovery of the connection between collective motion and particle motion in atomic nuclei and the development of the theory of the structure of the atomic nucleus based on this connection." Bohr died on September 8, 2009 in Copenhagen at the age of 87. 1922 Jun 19th Born in Copenhagen. 1940 Began to study physics at the University of Copenhagen. 1943 Bohr and his family escaped Denmark for Sweden because of Nazi occupation.